Rhizomatic learning, an open course with Dave Cormier, started on P2PU this week (or is that last week now?). Actually, it seemed to start before the course was officially launched because there was a real flurry of activity appearing beforehand in my inbox via Facebook and Google+ notifications and alerts, which didn’t let up once the course got going either. Such is the interest in this topic. Any way, I didn’t have time to check in to the course right away and find the content or the discover the task at hand but I was getting the gist via the conversation and postings in the channels mentioned above (oh and via the #rhizo14 hash tag on Twitter, of course), so that’s the reason for the sequence of my reflection here. The nomad is trying to do what I call ‘learning’. Not the recalling of facts, the knowing of things or the complying with given objectives, but getting beyond those things. Learning for the nomad is the point where the steps in a process go away. It’s what Wynton Marsalis calls ‘being the thing itself’. Nomads make decisions for themselves. They gather what they need for their own path. In order to create an educational system that allows for nomads we can’t measure for a prescribed outcome. All of this resonates with me completely. I feel rhizomatic. As such, I’m really keen to explore this further. Also, I’d like to explore the relationship and/or similarities between Rhizomatic Learning and Heutagogy (self-determined learning). At this point I was grateful to Penny Bentley for asking in the Facebook group, “is there a difference between Rhizomatic Learning and Connected Learning?” Dave Cormier replied by saying that there’s “overlap” but rhizomatic learning is “messier”. Thanks. 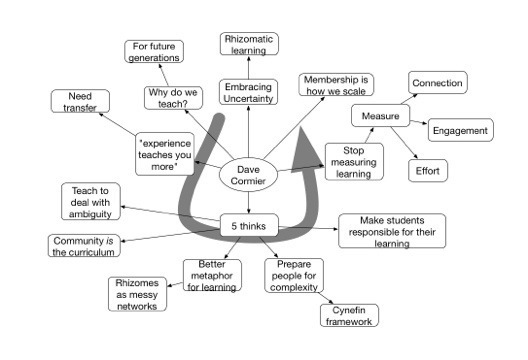 However, the handy part about the conversation was the mind map posted by Adeline Wall Avril (see below) as it illustrates that a core purpose of rhizomatic learning is to “make learners responsible for their own learning”. So, yes, there’s plenty of fruitful synergies to explore here. Over at the course ‘proper’, I’d already sussed the nub of the question before I logged on to start because I’d read a few blog posts reflecting on it (oh, and I knew Week 1 was entitled “Cheating as Learning”). Responses largely seemed to deliberate the semantics pertinent to cheating and equate “Cheating as Learning” with notions of hacking, gaming the system or cheating as unethical rule breaking. What was the question? Well, when it came to it, it wasn’t a question exactly, but a challenge, a challenge to take things we understand, like learning, and find new ways of talking about it, to take the idea of cheating and use it as a powerful tool to de-construct some of the inherent power structures and think about learning in new ways. Dave told us that he often sets his class a question, or problem, that simply can’t be answered alone; to get the answer you need to “cheat” – well group together/collaborate at any rate. The idea (I think) is to demonstrate what’s legitimate in certain circumstances and that what constitutes “cheating” may become altered, or no longer valid. That being said, when I first watched the video and heard the question, or challenge, I have to say that I was somewhat nonplussed; I just didn’t get it (I might still not); what was Dave getting at with all this talk about cheating? A ha. Could the reason be that the blog posts I’d read prior hadn’t really “spoken to me” and that the question, or challenge, failed to make much of an impression on me because I am, in a sense, already operating rhizomatically, in a rhizomatic learning environment, that is, a self-determined learner, learning on the open web? I think all the talk of “cheating” was away to start us thinking about what might legitimate learning practices be in a new learning paradigm… and who validates them. As I was starting to put this post together a raft of posts came in from other participants, all chewing over the question and summarising their learning. It was here that a missing bit of my thinking came to light. Thanks to Penny Bentley (again) for spelling it out. She asked:“Cheating as Learning”. Can students find their own path around learning objectives…is that cheating? Learning objectives!! Gosh, I’d forgotten all about them. That’s the bit I hadn’t factored in. Hey, it looks like prescribed learning outcomes really don’t figure for learning nomads – just like Dave has identified. Following on from this, I’m really interested to see how “The Community is the Curriculum” shapes up within this, and in what contexts it can be effectively applied. Before I sign off though, here’s a few of the blog posts that I read over the course of the week. Previous Post 2013, a year on the global learning commons. Hi Helen! Really love your post – great summary of your thinking and the conversations – what I’ve seen anyway (which is not all that much, really!). That mind map is really good too – thanks for posting it. I was also a little confused about the concept of ‘cheating as learning’ and what that really meant…but coming to think (as was suggested in Jenny Mackness’ post) that as there are so many possible interpretations of this, it was thrown out there primarily as a conversation starter – which it’s been very successful as. But like you, I had the realisation that – in an environment in which collaboration (and connected) learning is the norm, or expected standard – is ‘cheating’ as a concept even relevant? In a situation where knowledge is seen as a collective entity, socially created and not ‘owned’ by any one individual (but rather, perhaps, remixed and reinterpreted), does ‘cheating’ actually exist? The closest thing to ‘cheating’ in such an environment is probably using someone else’s work without attribution – or perhaps – outright plagiarism…but then even the notion of plagiarism implies individual ownership which may not be consistent with rhizomatic learning. But possibly (actually quite likely!) I’m misinterpreting the whole thing. I’m really just not sure anymore…. Anyway, thanks again for a great post and some great links as well!